By Judith Tripp as presented at the Veriditas@20 Celebration. Lee Matthew, our current Chair told me that she felt that it is important that we tell our stories as an organization. Like the family gathered around the Thanksgiving table or the tribe singing around the camp fire, we need our creation stories. We need to know who we are by where we have been, the leaps we've taken and the values we hold dear. Barbara, Margie, Gary and Dawn will be with us to tell those stories and I invite us all to listen to the tale, now 20 years in the making and telling. Listen for the threads of meaning that speak to you. Listen for the audacious and revolutionary. Listen for what soothes you into belonging. When I think of the history of our Veriditas, my mind goes way back to the builders of the Chartres Cathedral labyrinth in the late 12th century who knew to place this archetype in the womb of the greatest of all Gothic Cathedrals. I go back to our foremother, Hildegaard who lived during the same epoch where Robert Ferre tells us that God came to Earth for a century or so and then left again -- an epoch of light filled revelation. I think of Hildegaard's knowledge of the Greening Power of God -- a concept that rings through the ages and moves us today. In Tibetan Buddhism there is a notion of Terma which means that certain teachings are hidden by ancient teachers to be discovered at the right moment by adepts of a modern age when the time is right for them to reemerge. I think of our labyrinth waiting over the centuries for her time to come again. That is what I believe happened in the late 80s when Lauren first encountered our Labyrinth. Clinton was coming into his first term-- there was a shift of the generations- Bill was young, exposed to the mind expansion of his cultural moment. There was prosperity. Terrorism was something that happened far away on a small scale. Technology was just beginning its meteoric rise-- we could feel something was about to happen but this was way before 24/7 emails and social media. Eastern Religions with their emphasis on interior exploration, the inner journey and breath were prelevant and being expoused by the new age movement. There was a desire in many people to explore the depth of spiritual experience available to us in an increasingly small world. The Women's movement was in full flower-- Lauren was among the first women ordained in the Episcopal Church-- women's spiritual groups were flourishing. Women were beginning to come into power in politics, religion and business. There was a restlessness in mainstream religion and churches were exploring new ways of reach congregations. The Harmonic Convergeance had happened in 1987 and the shamanic world looked at this ensuing 20+ years as the most significant time in the planet's history. This is the context that Lauren's calling found its roots. Lauren once told me that she was very good at perceiving important underground streams in the culture. That she was enthralled by the Labyrinth and knew without question that she was to shepherd its reemergence in the culture is part of our story. We are grateful that she heard the call, perceived the long hidden in plain site teachings and persevered to bring us all this remarkable path of wholeness and peace. Lauren is a woman immersed in the inner life with her religious calling, psychotherapeutic training, and deeply introspecitve nature. She had made a bridge to the patriarchial world as a priest and held respect from people both in the conventional religious world and a collection of wild unchurched women and men. She was made for this assignment. 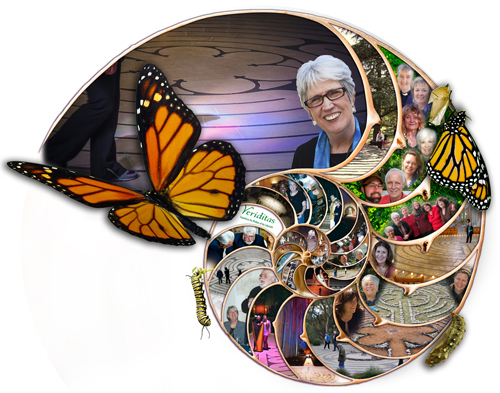 Her deep friendship with Alan Jones, Dean Emeritas of Grace Cathedral gave her project the support it needed and Lauren's tenacity and steady, sure knowledge of what the labyrinth called her to do has given us our remarkable organization. Barbara Hartford, Manager of Peacebuilding Programs at the United Religions Initiative, has been a close friend of Lauren's over the years. Barbara shared a letter from Alan Jones that aptly describes the first trip the Chartres where it all began. Click here to read the letter from Alan Jones. After establishing a relationship with Chartres Cathedral, Lauren also nurtured a personal relationship with Pere Francois Legaux who was then rector of Chartres. Pere Legaux was at first skeptical of these Americans who came to his church but his heart opened to our sincerity. Eventually, he was made honorary Canon of Grace Cathedral (the second time in history that a Catholic priest was installed as an honorary Canon in an Episcopal church) and Alan Jones was installed as honorary Canon of Chartres, (the first time in history for an Anglican priest to be installed as an honorary Canon in a Catholic cathedral). This was an unprecidented ecumenical event and permanently bonded Grace Cathedral to Chartres. 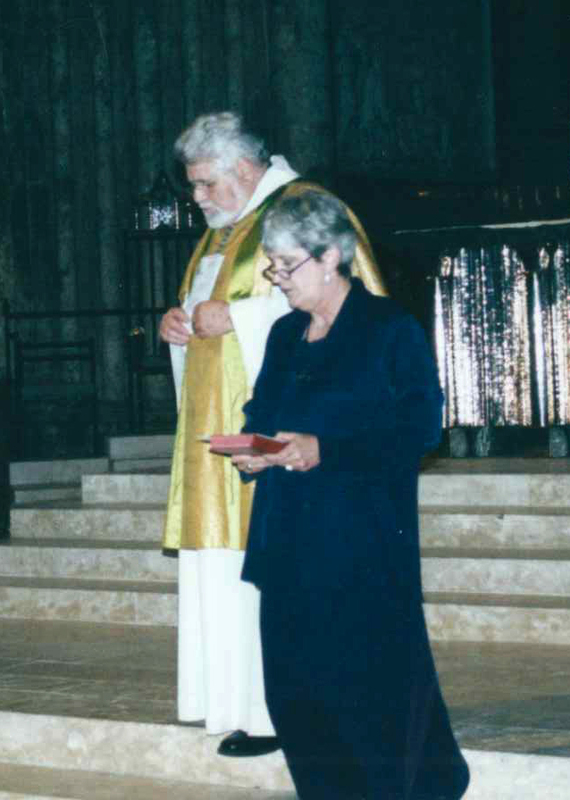 Beginning in 1998, Lauren led pilgrimages which included Chartres and her labyrinth. In 1999, the first of Veriditas' Chartres pilgrimages began and continues to this day. I was priviledged to be part of that first event when the labyrinth was opened for the month of May and hundreds of pilgrims from the US came to our programs. Margie Adams, singer songwriter, activist and labyrinth facilitator has known Lauren for many years. She shared her stories about the early days with Lauren and the link between the labyrinth and social activism. The first decade of Veriditas was a wild ride. In that time, many people were trained as facilitators, even more people were pilgrims, labyrinths were born all over the globe. Lauren's famous dictum about peppering the planet with labyrinths happened in grand fashion. The infrastructure of the organization strained with the number of projects, products, running an international pilgrimage program. There were some hard times and difficult decisions. 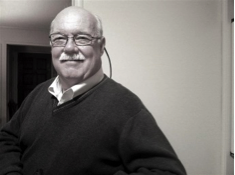 Gary Peterson, Chair of Veriditas from 2005-2015 took our organization through its next stage of development. 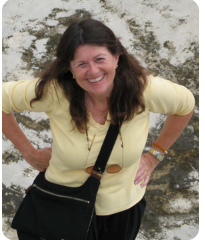 Dawn Matheny, our intrepid Executive Director has been the glue that has held our organization together. Her administrative brillance, giant heart, and visionary nature have served us well. Dawn, when we first knew each other, you once told me with tears in your eyes that you wanted to do Extraordinary Things. I think you have. Please catch us up to the present. Over these 20 years, so many people have volunteered their time and resources to Veriditas. Over 30 people have served on the board. A dedicated group of women and men have been part of the Veriditas Council since 2004, serving as an incubator for new programming ideas and a liaison with the facilitator network. Countless others have lit candles, prepared meals, welcomed students and pilgrims and shared in the multitude of tasks that are required to keep an international organization humming. Many others have shared their support financially. They are listed with deep gratitude in the Veriditas@20 program. We have trusted that the organizing principle of the labyrinth will spawn new programs, new ways to worship, new labyrinth designs to fit the needs of hospitals, retreat centers, schools and we have been astounded by the reports of people all over the planet who have created inner journeys in community for diverse populations. For me with my heartsong work with women, I appreciate the large invisible network of support that is Veriditas. Organic, wild, and often unsung, the work goes on. We have created a new way, listening to the labyrinth, making space for the inner journey in our institutions. I am reminded of a clip I recently saw where Meryl Streep was praising the invisible work of Hillary Clinton. She said that when Hillary was Secretary of State, she would always make an effort to contact the unofficial women's leaders as well as the heads of state when she visited different countries. Her very presence and the recognition she gave them created safety, inspiration and courage for countless women. I think that Veriditas and Lauren in particular have done a similar job of encouraging, a quiet revolution within the culture.